There was another deadly pirate attack last week, this time on a Greek VLCC (Very Large Crude Carrier) off the coast of Nigeria. 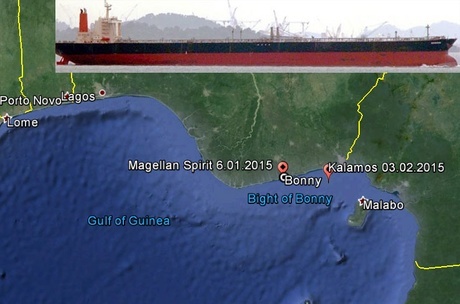 The vessel, MT Kalamos, was targeted by a gang of criminals at 2200hrs on February 3 whilst waiting to complete loading at a designated anchorage at Qua Iboe, Nigeria, inside territorial waters. Unfortunately, one of the officers sustained a gun shot wound and later died whilst being transferred to hospital. Two other officers and an AB (Able seaman) were taken by the pirates, and have yet to be accounted for. There were a total of twenty three crew members on board at the time of attack. Map indicating where the Kalamos was anchored. It’s a large vessel. “The worrying thing is the fact that it didn’t take long for maritime criminals to recognise the vulnerability of this vessel and to mount an attack within days of the tanker’s arrival with possible tragic consequences and the, hopefully temporary, loss of three of the ship’s crew. All of this just serves to illustrate the dangers of operating off the Niger Delta and the inability of regional security forces to provide a safe operating environment,” said Ian Millen, Chief Operating Officer of Dryad Maritime. The waters off the coast of Nigeria are infested with pirates..
Aeolos Management, managers of the Kalamos Shipping Corporation-owned MT KALAMOS, along with the authorities in Nigeria are working to establish the whereabouts of the missing seafarers.